I was driving down the Nicklesville Road, one of my favorite back roads in Southwest Virginia, as it meanders from Gate City, in Scott County, to Dickensonville up in Russell County. There are a few places where along this two-lane route (enumerated as State Route 72), one can view a strongly rooted patch of Kudzu vine. The vine grows by the yard during the warm summer months. I have sat through long meetings and escaped the moment by fantasizing how the Kudzu might actually reach across the road in those places where it grows on both sides, and in my imagination I’ve seen its tendrils reach across and meet in the middle, swallowing all the traffic that goes by for several days. I might need medication for that, I’m not sure. Kudzu grows and consumes the world. Some of us in the part of the country where Kudzu thrives have imagined it taking over the world. It’s vines cover houses, barns, abandoned machinery, and all kinds of things, choking life out of trees and softening the hard lines of power poles and just about any imaginable thing that sits still long enough to be covered. It has long been hailed as a problem plant. Yet it continues to thrive, and grow, and spread. 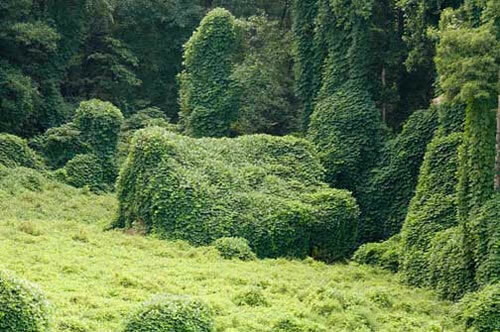 But as in all of life, there is an end to the vitality of the kudzu vines. In September this year we’ve already begun to see a few mornings with frost. The cold temperatures begin to kill the leaves, and soon they will fall off of the vines. After a bit the vine-covered patches will begin to look like messy hair growing over all kinds of things. In the cold part of the year you can see what is beneath the vines, the infrastructure of the kudzu. It’s difficult to guard the landscape of our hearts from the invasive vines of time. Without being watchful, we find ourselves covered with things that don’t matter, things that grow to consume us, choking out the vitality of our souls. Little by little, and day by day, we become covered with things that will destroy us. Pray for the frost to come and descend upon the Kudzu vines of our lives. Then we shall be able to move forward into holiness. This entry was posted in Seasons and tagged Dickensonville, fall, frost, Gate City, grow, holiness, invasive, kudzu, Russell County, Scott County, seasons, southern, Southwest Virginia, thrive, vines, Virginia, vitality. Bookmark the permalink.